Do you have a criminal record? Has your criminal record held you back from getting a job? 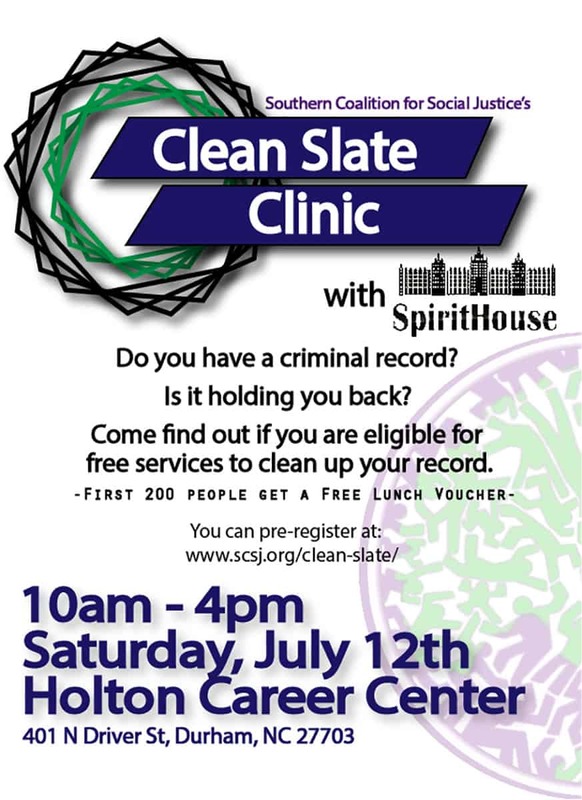 There will be a Clean Slate Clinic on Saturday, July 12 – stop by to see if you are eligible to clean up your record. Attorneys will be on hand to speak with you directly. Clean Slate services are FREE and the event is open to the public. There is no age limit, but we do not process juvenile records. There will be free food (for the first 200 registrants) and free parking at the Holton Career Center in Durham. Click here to register for the July 12 Clean Slate Clinic. What is Clean Slate work and why is it important? Involvement in the criminal justice system has negative side effects beyond a court case and possible conviction. Arrests and convictions trigger an additional set of punishments known as collateral consequences. These consequences operate outside of the criminal justice context even after an individual has served his or her jail or prison sentence, paid fees and fines, and completed parole or probation. Unresolved legal matters impede an individual’s ability to get a driver’s and/or employment license, or access to public benefits. Other barriers include exclusion from housing opportunities, extreme difficulty finding a job, and in some cases lack of access to higher education – all due to a criminal record. To combat this problem, SCSJ’s Clean Slate Program supplements the important services provided by our partner organizations with direct legal services and advocacy in the following areas: expungement and Certificates of Relief (COR), employment or occupational licensing hearings and driver’s license restoration. Learn more in our Clean Slate Clinic Handout. The focus of Clean Slate clinics is not simply to mitigate the collateral consequences facing justice-involved residents, but to begin to repair the structure of families that have been affected. Being involved in the criminal justice system often leads to joblessness and homelessness, which has an astounding effect on families, particularly in the lives of spouses, parents, and children. Click here to register for the July 12 Clean Slate Clinic. Click here to support SCSJ’s Clean Slate work!